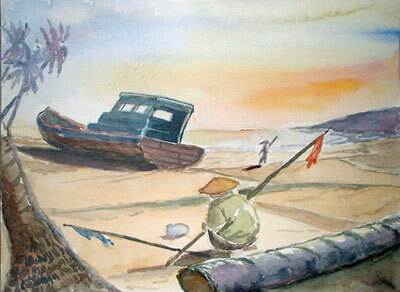 Malaysian Watercolours: Fisherman at Work - How do artists keep their skill? Fisherman at Work - How do artists keep their skill? This is an imaginary piece based on a photograph. It was a picture of an old fishing boat, by the beaches of Kemaman in Terengganu. The fisherman, the palm trees, and the figure in the distance, are all added in. The sunset, too. It's funny but after such a short time of not painting, every step is a painstaking effort. I wonder how professional artists cope with not painting or drawing. After say six months of not working with your painting, how do you start? Where do you start? I know of one artist who carries a technical pen in his shirt pocket everywhere he goes. Every minute he could glean out of his day, he draws. On envelopes. On discarded bus tickets. On catalogues he gathered at Immigration check points during his travel. On anything that permits. And all these, bits and pieces of his existence and encounters with life's realities, are translated into drawings which he may or may not paint later. Is this how artists keep their wits about them? And skill too? Use your skill or lose them to time? This piece was painted on April 23. Nice touch. I am a colours person - and I like your attitude keep low profile and outlook on life as expressed in your web site. Thank you, Whiterose. Life need not be lived loudly, although it can be, enthusiastically.